This has been on my to-do list for a while, so it only seemed fitting to finally visit Martin Luther King Jr’s Memorial on this sunny but chilly Monday (off). I’ve seen the Memorial from a distance before while driving by but never up close. It opened to the public last August but the official dedication ceremony was delayed until October due to Hurricane Irene. Many visitors have already been there since then. Obviously today it was an especially popular destination with whole families out and about despite the frigid temperature. The visitors span the demographic gamut: kids in colorful hats, couples strolling hand in hand, even a grandma with a walker. Everybody – including me – snapping lots of pictures. The Memorial sits on the westen edge of the Tidal Basin along the axis linking the Jefferson and Lincoln Memorials. It consists of the three main elements. First, symbolic Mountain of Despair, a massive boulder with a passageway carved right through it, forms the main gate to the Memorial. 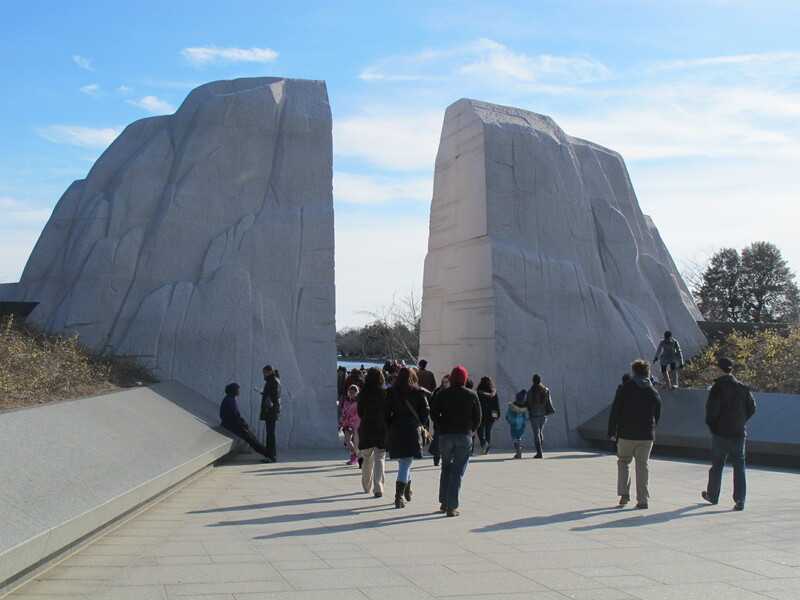 The centerpiece of the Memorial, a Stone of Hope, rises a few feet beyond that gate, with a monumental relief of Martin Luther King carved as emerging from the far side of the granite mass. On both sides, a two-winged inscription wall shows excerpts from King’s sermons and speeches. That said, I liked the memorial more than I thought I would. 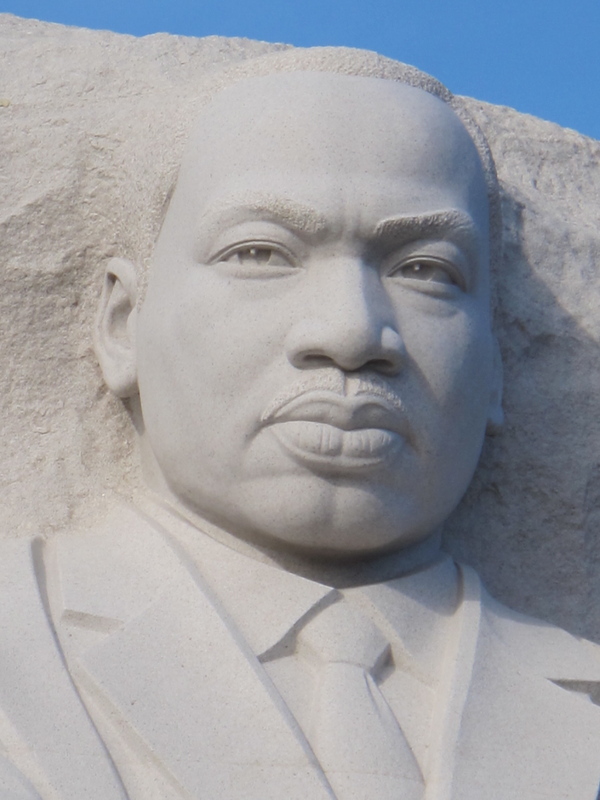 When you get closer, MLK’s visage looks less menacing and more thoughtful, and thankfully he’s not wearing a Mao suit. But aesthetics aside, what really makes the Memorial work – at least on the day like today – are the people who come to visit. You can see it in the eyes of the older ones in particular: they remember King’s life and struggles first hand and look at the Memorial with pride. 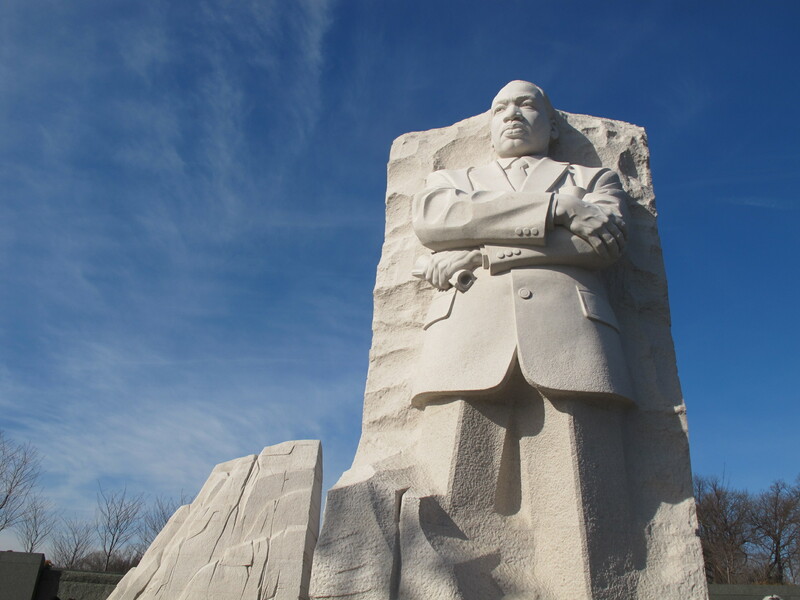 Many nod their heads as they read King’s quotes from the inscription wall, saying that those words are still as relevant today as in the 1960s. 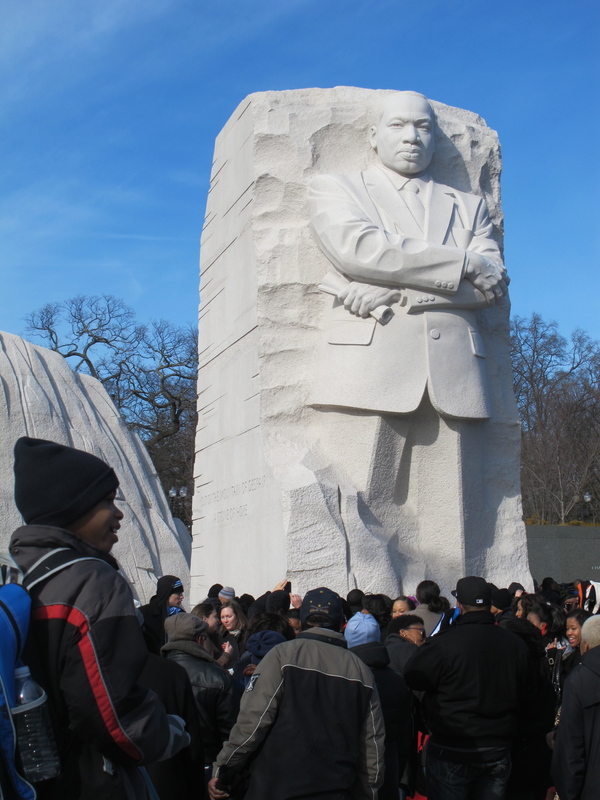 Watching kids – of all colors – curious about the Memorial is equally heartwarming, part of the dream in fact. The best part? Hearing a Latino father explain who King was and what the civil rights movement was about to his two adorable children in Spanish. E pluribus unum. “We must come to see that the end we seek is a society at peace with itself, a society that can live with its conscience.” – Martin Luther King, Jr.